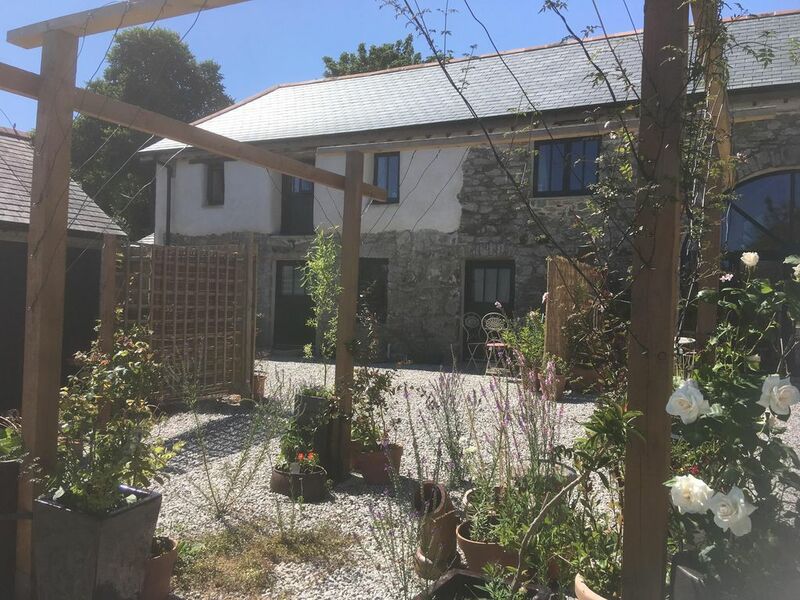 Set in 100 acres of pasture, orchards and gardens for you to unwind in, you will find Coombe Barn at Cusgarne Farm, with its lime washed walls, slate and wooden floors, underfloor heating and wood burner, a tranquil countryside retreat. Facing south, and one of four barns set around a courtyard, Coombe Barn looks out over a gravelled courtyard to orchards and the valley beyond. The airy upper floor has an open plan kitchen/living room/dining room while the ground floor has two spacious en suite bedrooms, opening out on to the courtyard. We are Greg and Teresa Pascoe. We own and run Cusgarne Organic Farm, which is a small mixed farm in a beautiful, peaceful part of central Cornwall. Coombe Barn is a newly completed beautiful reverse level barn, with lovely countryside views. Great attention to detail has been taken at all levels of the building and finishing of this project to ensure it is a simple yet very comfortable place to unwind and enjoy being in Cornwall. We were a family group, grandparent, daughter and her two sons. We also had two dogs with us. The accommodation was super, the upstairs living area was beautifully fitted and the bed settee , used by are daughter , was appreciated by the boys for early morning TV. viewing whilst grandad was able to have a peaceful lay in. The downstairs bedrooms both have doors onto a shared garden area which was beautifully planned to give space and outside seating yet with carefully positioned screens to give privacy. The children loved the freedom to explore the surrounding fields, and enjoyed feeding the chickens. This is a great place to stay with dogs with lovely surrounding area for quiet dog walks. This will certainly be on our list for a return visit . It is also a very good base for visiting both north and south coast beaches and attractions. So glad we booked. The location was stunning and a great distance to see all cornwall has to offer. Everyone was friendly and very welcoming. Accommodation catered for all of our needs including a 14month old. Comfortable beds and fantastic showers. We will be coming back, highly recommend. Ein Bio-Bauernhof zum Wohlfühlen - mitten in Cornwall! Unsere Familie mit vier Kindern hat die Zeit auf dem Biohof sehr genossen. Die Räumlichkeiten sind modern und sauber. Fragen werden schnell beantwortet! Die Vermieter nahmen sich auch viel Zeit, uns ihren Hof, die Tiere und die Weiden drumherum zu erläutern. Der Hofladen lädt täglich dazu ein, die frischen Hofprodukte (Fleisch, Eier, Gemüse etc.) und zahlreiche andere Bioprodukte einzukaufen. An vielen Sonnentagen konnten wir nach kurzer Autofahrt (ca. 30min) tolle Strände und steile Küsten genießen, sowohl nördlich am Atlantik als auch südlich am Kanal. We loved it, dear Teresa and Greg! Thanks for all!